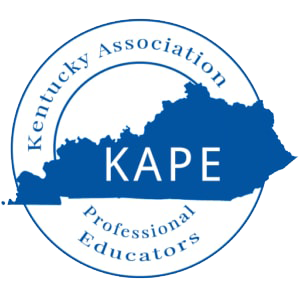 KAPE is pleased to announce the 2018 KAPE Scholarship Recipients. Our first KAPE scholarship recipient is senior Samantha Bishop. She received our Student Teacher Scholarship this evening at the annual program at the University of the Cumberlands, where she was a KAPE student member. Presenting the scholarship is KAPE Executive Director Donna House and Scholarship Committee Chair Joann Durham. Samantha is from London where she graduated from South Laurel High School. She comes from a large family of teachers and other KAPE members. Congratulations, Samantha! Our next recipient is Taylor Cobb of Richmond, winning the College Student Member Scholarship at Eastern Kentucky University where she is an Education major. Presenting her award is Joann Durham, KAPE Scholarship Committee Chair, and Donna House, Executive Director. Congratulations, Taylor! KAPE’s recent scholarship winner is Alexis Brooke Halsey, daughter of KAPE member Doug Halsey, in Breathitt County. Brooke is a senior at Breathitt County High school who will be attending Morehead State University this fall to pursue studies in Elementary Education and Special Education. She has already received her Associate of Arts from Hazard Community and Technical College - KCTCS. Her parents and KAPE are proud to present her with the Family Member Scholarship 2018. Presenting the scholarship to Brooke at Senior Awards is KAPE Director Charisse Cody and Executive Director Donna House. KAPE is proud to sponsor Whitley County High School student Jared Wilson to attend the national Educators Rising Conference. Presenting the sponsorship is KAPE Ambassador Regina Petrey Huff, educator at Whitley County Middle School; Jared Wilson; faculty sponsor Johnny White; and KAPE Scholarship Committee Chair Joann Durham. Congratulations to KAPE member Adora Vann at Whitley Central Primary, winner of a KAPE Professional Development Scholarship. KAPE Executive Director Donna House, on the left, is presenting the check to Adora. Congratulations! Congratulations to Assistant Principal Amanda Croley at Whitley County High School who mentored a winning senior for one of KAPE’s scholarships to be announced Tuesday, May 15, during Senior Awards Night. Pictured above giving her the award is left to right, KAPE Ambassador and long time member Regina Petrey Huff, Amanda Croley, and Scholarship Committee Chair Joann Durham. Thank you, Mrs. Croley! Today’s Professional Development Scholarship recipient is Cynthia Cain, teacher at Paris Middle School. Congratulations, Cynthia! The next scholarship recipient is Damonica Partin, media specialist at Robert Campbell Jr. High in Clark County, who won a professional development scholarship. Congratulations! Congratulations to Kiersten Jackson, winner of our Fall Student Teacher Scholarship. Kiersten is currently student teaching in the Laurel County Public Schools district and will be a graduate of Eastern Kentucky University in December. Presenting her with the scholarship award is Joann Durham, Chair of KAPE’s Scholarship Committee. Kiersten has been a student member of KAPE at EKU.